Listen here to a conversation between two members of the Louisiana Poor People’s Campaign, Jasmine Pogue and Mia Taylor, on WHYR’s weekly call-in show A Pause for Thought (live Wednesdays @ 5:00pm). 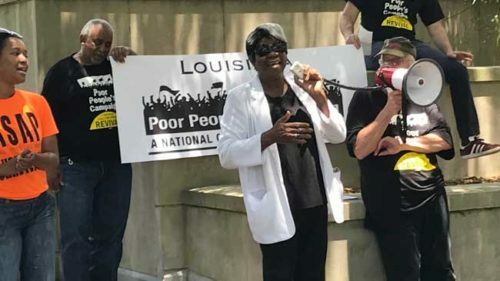 In a half-hour live conversation, host Wayne Parker, Jasmine and Mia discussed the goals and actions of Louisiana’s Poor People’s Campaign and the national movement against poverty occurring on the 50th anniversary of the original 1968 Poor People’s Campaign. In this episode, you’ll hear about the history of race and racism in America, why Mia and Jasmine got involved, the importance and strategy of this year’s national Poor People’s Campaign and what the Louisiana Campaign is doing in Baton Rouge this summer to demand moral renewal in what Louisiana’s state government prioritizes in the state budget.